In 5- to 6-quart Dutch oven, cook bacon over medium-high heat 5 to 6 minutes, stirring frequently, until crisp. Stir in onion, celery, potatoes, frozen corn and thyme. Cook 5 to 6 minutes, stirring frequently, until onion and celery are softened. Make this cozy soup the star of a simple meal. A basket of hearty whole-grain or sourdough rolls or breadsticks is the only accompaniment needed. Perk up the presentation of this chunky chowder by sprinkling each serving with chopped fresh thyme or parsley. 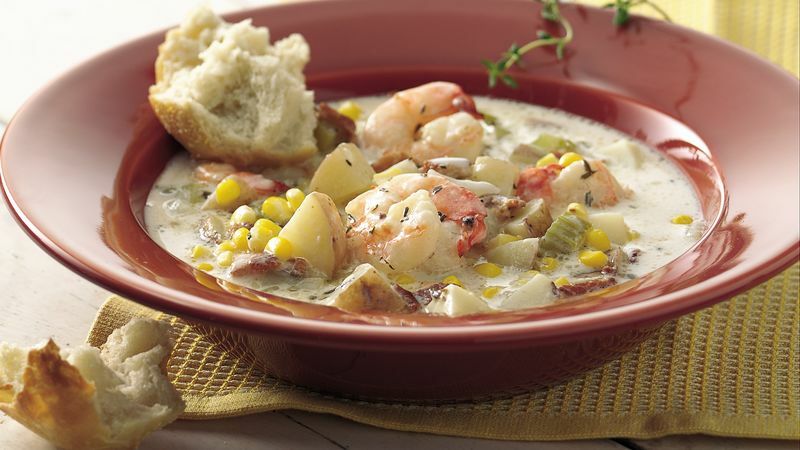 The term chowder is used to describe a thick, rich soup with chunks of food. The name comes from the French chaudière, or "cauldron."